Last night, I and two old friends – Tony and Jon (he who is Dood) – had the pleasure of an evening at Stamford Bridge, sampling the delights of the food and wine that will be on offer to the high end Chelsea season ticket holders this season. Our friend DC is one of these. Unfortunately he is on his hols at the moment, but he was good enough to book us into the event. Once again, I have to say that the quality of everything and the professionalism of all the staff involved was second to none. We didn’t get to talk to Gareth, the events manager tonight, but thanks mate for a great evening. The evening began with a drinks reception in part of Marco’s, one of the restaurants in the Stamford Bridge grounds. There we were, sipping our Mojitos, when who should come along to talk to us than Ron “Chopper” Harris, legendary Chelsea left back from the 60s and 70s? 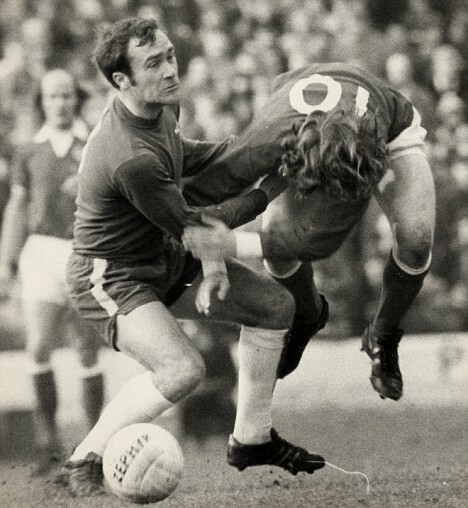 As his nickname suggests, he was as hard as nails, and his preferred method of subduing the winger opposite him was to give him a few heavy tackles at the start of the game, which, as Ron said to us, “kept most of them quiet for the rest of the game”. It’s fair to say that, in the modern age, he’d be red-carded before ten minutes was up – two yellows, most likely. Ron played in the famous – infamous? – encounters between Chelsea and Leeds in the FA Cup of 1970. It was the first time that the FA Cup final had gone to a replay since 1912. Both games were played on mud baths. I missed the first game on TV as I was flying back to England from Cyprus, after my Dad’s three years tour of duty (he was in the RAF) came to an end. The first game ended 2-2. Chelsea won the replay at Old Trafford 2-1, after a brutal battle. As Ron reminded us, there were no bookings! The two clashes were deeply symbolic at the time: Leeds portrayed (in the South anyway) as the dirty northerners, Chelsea as the fancy dans from the Kings Road (their ground is actually on the Fulham Road). Both portrayals only told part of the story: Leeds were incredibly skilful, as well as cynical and ruthless, Chelsea were just as hard as Leeds, and could dish it out. David Webb, Peter Osgood… and Ron. The games had such a hold on the football nation that we used to play Chelsea v Leeds in the school playground with a tennis ball every playtime. As 10 and 11 year olds, we all had to be a player. I was Alan Hudson for Chelsea. He was a long-haired skilful midfielder who never truly fulfilled his promise. We had a few of them in the 70s in England – at international level the managers never really trusted them, so they didn’t blossom in the white shirt. Needless to say we failed to qualify for both the 1974 and 1978 World Cups. So I, and my friends had the greatest admiration for Chopper and his ilk. He never played for England but he can count himself unlucky. Far worse, less reliable players did. Naturally he lamented the changing world of football, the diving and the clampdown on tackling – “it’s a non-contact sport these days”. Predictably, he attributed this to the foreign players, and he’s right up to a point, but not because they are cheats. They are simply wilier – the culture in most other top football nations isn’t about piling in to win the ball. It’s possession and interception. And forwards win free kicks by just making sure the defender’s leg or body makes contact. It’s a cleverer tactic than the old-fashioned English response, which would have been to give as good as you got. We asked Ron who was the toughest centre forward he came up against. He said Andy Lochead, the Aston Villa striker – balding, no teeth, all elbows. A Scottish battering ram. Wouldn’t get far these days – the players are all too fast, and all those elbows would get red cards. Same for Ron really. His style just wouldn’t work in this day and age. The players are fitter, faster, better drilled, with a better touch. The pitches, at the top level, are transformed. The fact is that if a player of Ron’s type tried to rough up, say, Mesut Ozil, it wouldn’t work. He wouldn’t get near him. He’d be on his arse as Mesut drifted effortlessly by. We did talk about the current Chelsea team too. Ron had started by asking us if we were optimistic about the new season. He didn’t know we supported, between us, West Ham, Nottingham Forest and Brentford! Still, if you are a football fan, you’ll have a view on Chelsea. We agreed it would be a more competitive battle for the top slot this year. Both Manchester clubs have bought heavily. It’s probably between Chelsea and those two. Premier League predictions for the 2017-18 season coming soon! So, a great evening. Fed and watered sumptuously, and treated to a wonderful trip down memory lane, with one of football’s greatest hard men, the inimitable Ron “Chopper” Harris. This entry was posted in Sportsthoughts and tagged Chelsea, football, Ron Harris, Soccer, sports. Bookmark the permalink. Excellent article as ever. Surprised to find out he played over 60 games for Brentford, after 795 at Chelsea. 20 years at a top club is incredible. An iconic player. Yeah, didn’t realise he’d been a Bee. You should have revealed your allegiance! Quite right. First since 1911. Corrected. Anyway, aren’t we in a post-facts world now? And how about identifying the third man in the photo? If you can’t I bet the Forest or Brentford supporter will. Excellent. not sure Ozil would do Ron. Maybe Hazard. It is a different game as you say – both versions have their merits and drawbacks. And 70 has to be the ultimate FA Cup final- so many characters and memories. Ozil no question! Yeah Hazard too. No other final had that playground effect, that I remember. First Replay of a Wembley Cup Final. And, I’m not entirely sure but could the Third Man be Terry Mancini? Love the fact that DC’s gone straight to Terry Manc. What a rug! Quite nice that his last club was Barnet. Nice to excite a bit of debate in the comments section! Yes, good to have some debate. And yes, love DC going straight to Terry Mancini. Don’t mean to cause aggro at all but have to say Dood is correct whilst John S is still peddling fake news on Cup Final Replays (according to Rothmans anyhow). 1911 replay was the last at Old Trafford before 1970 but there was also a replay in 1912 in Sheffield. Well, obviously I meant the 1911-12 season! Wow! I love a fab social event with food and drink! Okay, the post is so much more, but I love the party part!